Our Non-medical Home Care Policies & Procedures manual is only offered as an instant download. The Download Version is an electronic, MS Word document that can be downloaded immediately for viewing and/or printing. After your order is placed, you will receive confirmation within moments. If your payment is approved, you will be re-directed to a download page from which you can immediately download the Emanual. Download times will vary, depending on your internet connection & other personal hardware issues. Click on “Extract” button to start the extraction. Select Extract All from the context menu. We are pleased to offer you an excellent range of fully editable pre-written policies & procedures, guidelines and forms written/produced using MS Word. 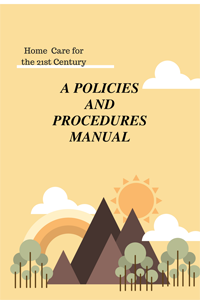 If you are just starting out and/or want to improve your existing business operations our Non-Medical Home Care Policies & Procedures Manual will prove to be a very valuable resource. It contains important policies and procedures which provide the framework that defines your company’s/agency’s operating principles and processes. Our Policy & Procedure manual will also prove to be very useful in helping you with any licensing requirements for a non-medical home care business. Our Non- Medical Home Care Policy & Procedure Manual is not state/province/territory/country specific. It is based on U. S. Standards,Rules and Regulations which reflect the Best Practices of all states/countries and can be used by any country. The policies can be easily edited by tweaking, deleting or adding new policies to conform and comply with any state’s or countries specific licensing requirements. help to orient new staff, employees and contract workers about their purpose, job standards and expectations. Pre-written policies & procedures. All the policies & procedures are pre-written/produced in Microsoft Word (MS Word). Since the policies are pre-written you will save a lot of time and effort as well as money. You will need a copy of MS Word. Easy to edit and customize. Easily editable in MS Word. Add your own company/agency name and logo to give your Policy & Procedure manual that personalized look. Easy to modify the content to better suit your requirements. Easy to add additional policies and/or delete ones you don’t need. Each policy & procedure is a separate document. Value added. Forms, guidelines, definitions, references and cross-references are provided. Flexible. Even though the manual is tailored to the American home care environment, it can be used in any country as a template, since it is easy to modify and/or add/delete content to reflect your agency’s/ company’s policies and/or those applicable in your local area.